Good News for the applicants seeking for the Madras High Court District Judge Admit Card 2019. The Officials declared Last week of March 2019 is the release date for the Madras High Court District Judge Hall Ticket. Also, the Madras High Court District Judge Exam Date are mentioned for each and every process of the selection very clearly. Moreover, you will get full information by checking the below sections of Madras High Court District Judge Selection Process. Scroll down for further more details. Also, the direct link to download the Madras High Court District Judge Hall Ticket 2019 from the official site. The Selection Process for the District Judge (Entry Level) Posts includes the Prelims Exam followed by the Mains Exam. Later, Personal Interview is conducted as Viva-Voice for the candidates selected in the Written exam. The Madras High Court District Judge Exam Date is released. Thus, you can get the exam dates for the Three rounds of the selection process from the table given table. 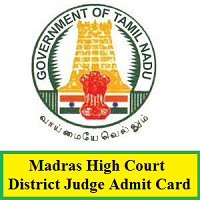 Candidates should bring the printout of their Madras High Court District Judge Admit Card card in the examination hall. The candidates must note that the admit card will have some instructions for the exam day and that they should be obeyed by all. Candidates should download their Hall Ticket before the date of exam. Candidates after downloading the Hall ticket, need to check the personal details printed on the Madras High Court District Judge Admit Card. Also, the Hall Ticket contains the data of the candidate such as Exam date, exam center etc. The Madras High Court Officials are not allowing the candidates for the examination hall if the verification is not done. So, candidates by keeping this in mind, you should carry any one of the below given Identity proofs for the Exam. If you don’t have any proof, then please apply for the Identity proof. Because it is the most important document to carried for the Exam. Now, search for the Admit card link in order to get the Madras High Court District Judge Hall Ticket and know the Exam Date. Finally, you will get the Madras High Court District Judge Admit Card. Download it and make more copies of it for further professional purpose. Thank You for staying with us. Hope you got all the details of the Madras High Court District Judge Admit Card and Selection Process. Keep in contact with us through Freshers Now.